Mobile Advertising firm AdMob recently released its latest monthly Mobile Metrics Report. In the September 2008 edition the Palm Centro ranked in the top 10 of all US mobile phones at number 6. If you take the feature phones out of the picture, the Centro was nearly at the top of the list and even managed to edge out the iPhone during the same month which placed seventh. The report also reveals some other interesting statistics. 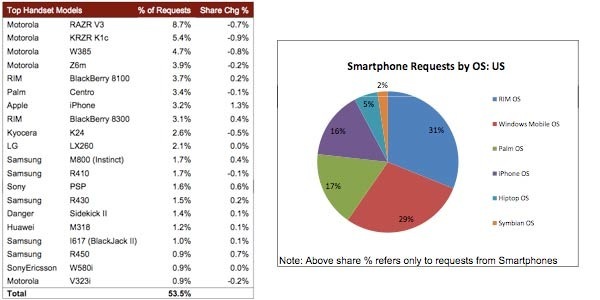 In total worldwide requests Palm came in at 1.8% (4.5% US), while its two major competitors RIM and Apple, came in at 3.5% and 2.5% respectively. In terms of requests by smartphone OS, in the United States RIM had a lead with 31%, Windows Mobile 29% and the Palm OS came in third with a 17% share again just slightly edging out the iPhone with 16%. Worldwide the percentage was much lower at 6%, reaffirming Palm's current weak international sales. In the US alone, AdMob saw a total of just under 2 billion requests, a 2.7x increase over the same month last year. The report is based on statistics from the total number of devices that are served ads from its 3,500+ mobile publishing partners. (The PalmInfocenter Mobile site includes AdMob advertising). -Palm had more than ONE SINGLE remaining Palm OS smartphone? -POS had a "real" browser available for the platform. If the rumors are true that Palm repeatedly turned down offers from Opera to make a browser for Garnet and instead stuck with the ancient Blazer...wow. Heads should really roll for that one. Well, in 2-3 weeks the BB Storm should be available for VZW and I'm fully intent on having a huge fondle session with that one. It'll be the first serious thought I've given to going back to a conveged device since the 700p disaster. It'll also be the first realistic possibility I've had of leaving the Palm platform for greener pastures. it's too bad that palm loses money on every sale. that's some business model. wow, tam hanna is a hater now? why is buying a Centro on a 2yr contract dangerous? >why is buying a Centro on a 2yr contract dangerous? I'd like to know why as well, since my wife just got one. Should we cancel? It's not "dangerous" per se, it's just that being tethered for the next 2 years to a rapidly fading OS on a device with ho-hum specs is (in my oh-so-humble opinoin) not the best course of action for anyone whose needs might outgrow the Centro's capabilities. Remember, the Centro's specs are essentially identical to the 2.5 year old Treo 700p and not that much better than the Troe 650 of 2004. If Palm tanks or pares the company down to a shell of its former self, it might be kinda hard to find stuff like spare batteries, cases & Athena Multiconnector accessories for the Centro in 2 years' time. But the software support would be my main concern. Dataviz and similar companies have essentially said they have plans for no new future Palm OS versions of their apps (just refinements of the existing versions). On Palm's side, the lack of improvements to Blazer are very worring as well: if Blazer 4.x begins having issues with some mobile-optimized sites, then that will effectively hinder a huge aspect of the Centro's viability. Like it or not, the web browser has become the de facto killer app for handheld devices. That Palm has paid so little attention to the two pillars of the modern smartphone experience (e-mail & web) and instead flushed money down the toilet on the MyPalm portal, the Fooleo, silly contests with B-list celebrities, multi-colored Centros, "designer" cases, a FaceBook app etc etc. indicates to me that the company doesn't take its users, its devices or its long-term future seriously. While the Centro is a fine basic smartphone platform at the moment, I cannot help but think that most people are either buying it because of price (cheap) or size (small).Then there's the handful of legacy users who are buying it by default simply for an utter lack of alternate Palm OS devices on the market and who understand the inherent limitations of the platform. But I would imagine that there might be plenty of first-time smartphone owners who have bought a Centro in the past year and would consider upgrading to something else from Palm within the next 6-12 months IF Palm had something to upgrade to...and a 128mb RAM Centro in a new color doesn't count. tethered? like any other smartphone, you just continue to use the device until it breaks, wears out, or doesn't fit your needs anymore. then you simply buy another device. with the centro at $99 or less, it's not a big investment. and most carriers have prorated ETFs so even that risk is mitigated. when my centro no longer works/fits, i'll simply buy another device. regardless, i'll stick with sprint because that $99 unlimited everything plan is a beautiful thing. i refuse to let vzw or att f**k me every month. i've had all three, and sprint has been the best so far. i left a couple of comments for tam. i wasn't totally happy with his centro vs. 680 camera review. Since when did YOU care about such trivial/nerdy matters like Centro vs. Treo camera comparisons?? all in good fun. it's 4am now in Europa - he'll have a nice surprise laugh tomorrow. Heck, I just had a good laugh here at midnight EST after actually reading your comments! Good one! I would bet that phones like the iPhone rarely visit mobile web sites, instead surfing over to full-blown non-mobile websites. good point. and i love the #4 and #6 rankings. 4/6 and 6/10 aint nothing to brag about. It all depends on what you want out of your phone/PDA IMO. While it would be great to have a bigger screen, faster speed, wifi, more RAM etc. I don't need any of that for my daily business use. I find the Centro works just fine for what it was designed for. Okay phone, great PDA, MP3, email, syncing with my Outlook, financial calculator and a whole lot lighter and sleeker than my past Treos 600 and 700p. Also, 1,000s of Palm OS applications, acceptable ebook reader and photo viewer are a plus. It is frustrating that Palm takes so long to release new models, but I was happy to replace the 700p with the Centro that will serve my needs for a long time. And, if my Centro fails then I will replace it for <$100 with another Palm or make the switch. I can live without A2DP, wi-fi, GSM 3G etc. for the time being. The saddest part is that without too much $ or effort (but more than Palm is willing to expend!) at least half of the above *could* be incorporated into a Centro 2 running Garnet. Centro refresh needs a flat/flush screen! Centro share FELL compared to August 2008; 755p and 700p FELL out of top 20. and you call this ranks well? Tam, care to clarify that statement? I don't see much analysis there at that link and I think your biased remark is completely unwarranted. More importantly, IMHO and as noted up above in a different comment thread, Admob measures ==ONLY== mobile web site traffic and ==ONLY== THAT traffic that uses their ad servers - so you're talking a small subset of a small subset of all sites visited by those who use phones and a small subset of a REALLY small subset when you're talking about larger-screen phones like the iPhone where folks probably don't even VISIT mobile web sites with any frequency at all. That is to say, the "statistics" are pretty meaningless regardless whether they're "going up" or "going down". to be honest: I have forgot to process AdMob Aug 2008 when it came out - and thus had them both open at the same time. I have compiled two images showing how thew Treo 700 and 755 fell out of the top 20 in the US - believe it or not, as both boxen still where in there in August. P.S. Used the wrong word there - please get unbiased with full replace!